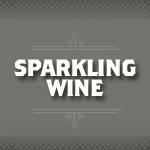 Sparkling wine is a wine with high amounts of carbon dioxide within it, making it fizzy. The most famous example is Champagne. The carbon dioxide can be present due to natural fermentation or as simple as carbon dioxide injection in some less costly brands. Usually white or rose, there are some red versions as well. The grape is picked healthy and whole. After traditional fermentation of the base wine, the second fermentation called "foam creation" takes place in the bottle.